This is one of my favourite pieces of original furniture that my dad has come up with. 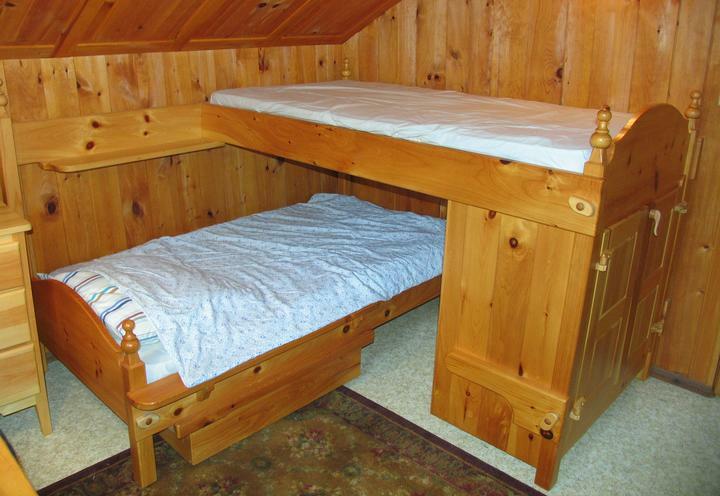 Its a right-angle bunk bed. It solves the whole problem of the person lower down on the bunk bed not being able to sit up in bed. There is a small storage closet on the right side. There's also a drawer under the lower bed, for storing more stuff. Also a small shelf above the lower bed, handy for things like alarm clocks. The bed is held together with wooden screws - the odd shaped pieces of wood on the bed rails are wooden nuts that screw onto wooden pegs with screw threads on them.